This week, let us introduce you to the Soulslinger - formerly known as the Gunslinger - the second class you can find in Othercide ! Nizar and Alexandre, Game Designer and Art Director on the project, write about her abilities as well as her concept design evolution over time. Alex: Within the three classes we have in Othercide, the Soulslinger is by far my favorite; and I am not saying this because I am an absolute fan of Stephen King’s “Dark Tower” series! (Well okay, it does play a part in my subjectivity…). She has the full panoply of a “western spaghetti movie” design, but with an additional flavor coming from the lore. 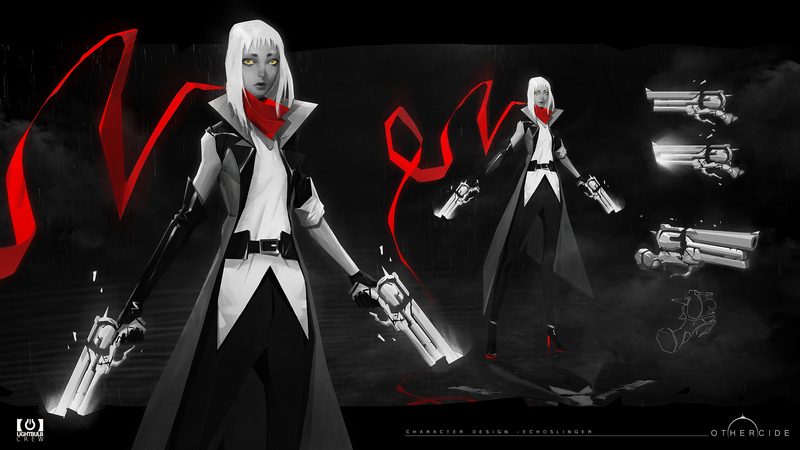 The Soulslinger is a sharp shooter, mastering a pair of heavy pistols, but also a mystic manipulator which enchants her weapons with spirits and ethereal essence, in order to master the deadliest effects. Nizar: Actually, the Soulslinger is the only Daughter specialized in ranged combat. She is the perfect opposite of the Blademaster which was the focus of our previous blog post. While the sword-woman was perfect at doing high damage to a single target in melee, the Soulslinger will attack in large area of effects (AoE) with a lower damage output. While not being as lethal as her sister, she can hit multiple enemies in a single attack which is essential when dealing with a swarm of weak creatures. Alex: But the Soulslinger is also a great protector for the other Daughters, right? She can help them getting out of dangerous situations, or support her sisters by boosting their initiative level or by adding some additional damages. Nizar: Exactly! The specificity of the Soulslinger does not stop here, she offers more than just another way to kill enemies. Most of her abilities are based on two core pillars in Othercide’s gameplay: the “Initiative Sequence System”, and the “Interruption/Reaction” behavior. The Initiative Sequence System defines when a unit, ally or enemy will become “active”, depending on their initiative score – the lower the score, the sooner it will act. The Soulslinger can affect the initiative of any Daughter, allowing her to play faster and/or more often. This can be useful in many situations: dodging an incoming attack or kill an opponent before he can have his own turn. You can even help finishing a Daughter’s initiative-based action sooner, creating a deadly chain of actions! As I said, the Soulsinger also has several “interruption and reaction” abilities. These are special skills that will happen before or just after an action is performed by another entity. For example, some of these abilities will completely cancel the kind of action they are linked to, allowing the negation of an enemy attack for instance. As there is no easy way to heal your Daughters in Othercide, each wound can become a real problem. Therefore, “interruptions/reactions” can turn the tide of battle… but keep in mind that everything has a cost! The Soulslinger is the class with the largest number of reactions and interruptions, a real game changer. She is also the weakest of the Daughter, with low Health Points, Dodge and Armor. She is at her best while protecting her sisters at distance, harassing enemies from afar. Personally, I think it’s the most rewarding way to play this class: her abilities give a very strong feeling of mastery when everything you settled combines together according to your initial plan. Alex: The initial intension for this class was quite limpid: we wanted to obtain the classiest, quickest gunslinger ever! I am a real fan of the game “Resonance of Fate” by tri-Ace, and their bouncing agile characters were a great inspiration when we had to address the design of the Soulslinger. Therefore, this sharp shooter is always using very fancy posing, almost like if she was handling “twin-blades” instead of a pair of guns. Her associated VFX are very ethereal: she is a gunner as well as a sort of “esoteric caster”, manipulating auras and the “mind” of her enemies. Othercide is a game of psychological influences, a war between human feelings, metaphorically represented by a desperate battle between fierce Daughters and horrible Nightmare Creatures. The Soulslinger is at the junction of our ambivalent universe:she is a very clear and neat “grounded” gunslinger, but at the same time a spiritual influencer with ethereal powers. Have you noticed that our Daughters have yellow eyes? It is the only detail in the entire game where you have another color than “red”… and a sweet lore secret behind it! Maybe you will find out the reason by playing the game, my lips are sealed! The Soulslinger evolved a lot from the initial sketches and through the great talent of our artists. At first, we had a very grounded hitman, with a half-realistic design still a bit too “common”. The main design evolution was the synthetization pass we made on all our Daughters: each class is unique in its mechanics and game design and still look as a harmonious team in terms of art design. There is a meaningful choice behind the common faces and silhouette our Daughters share; you will discover it early in the game, and we will talk about it relatively soon from now! 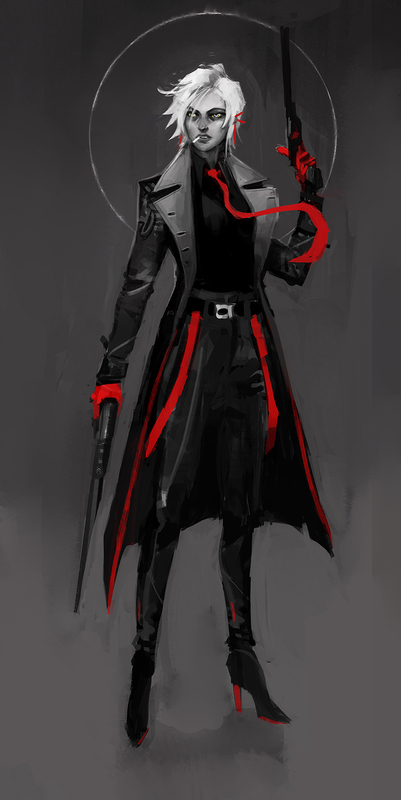 As for the Soulslinger, we tried to find a mix between a Western cowboy style and a “haute couture” costume model. A lot of those variations were very convincing, we just had to find the right balance between grey, white and black elements. Of course, we couldn’t achieve the design without granting deadly guns to our Soulslinger. 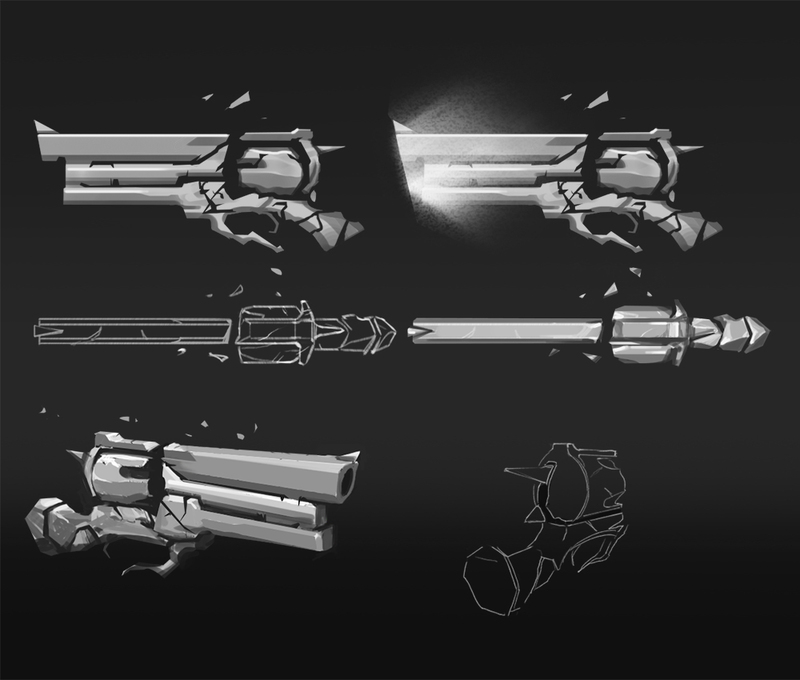 For our Soulslinger, we wanted to create weapons reminding classic revolvers but with a more powerful look. On a technical level, we needed to use a hard surface modeling. It differs a little from a classic way of sculpt: in order to obtain the polished hard surfaced parts of the gun, we first worked it in Maya (standard modeling), and then went in Zbrush for details (organic sculpt). Everything starts by Sebastien’s concept art, a 2D step that gives us the opportunity to test designs and find the right balance between the character and his accessories. The most obvious reference was Hellboy’s fat weapon, the Samaritan revolver, but we added an extra supernatural flavor. While the sculpt was progressing, as we were then testing the details, we realized our first intentions did not suit the idea the Art Director had in mind: it was massive and kind of “magical”, but the massive amount of details seemed to hinder the supernatural origin of the pistol. Therefore, we focused on the silhouette and with the help of our Tech Artist Nicolas, the weapon obtained its final material: a mix of “ceramic and magic”, as we joke in the studio (and it has been very difficult to craft the right shader)! There are fragments floating and surrounding the gun, and the material itself gives a feeling of inner energy or implosion, a glow beating like an incandescent ember. The Soulslingers are now ready for battle! Nizar: Designing the Soulslinger was challenging, especially from a balance point of view – her unique range capacity can easily be overpowered when compared to her melee sisters. But she was also the one with the most exotic abilities, and I’m curious to see what our players will be able to achieve with her! Alex: Can’t wait to hear those explosives gunshots in-game aswell!